My Mean Girl is pretty bloody awful. She tells me I'm too fat, not educated enough, that no-one will like my stuff. She also tells me I need to work twice as hard as everyone else to get anywhere, and that I don't deserve any time off. What a sweetheart. The first time I was introduced to the concept of my Mean Girl/Ego was in about 2012. Up until then, I had just assumed the voice in my head was me, telling it like it is. Telling the truth. Even when she told me daily it was a ridiculous notion to try and start my own business. That going after any 'dream' was on par with flying to Jupiter - completely beyond reality and totally self-indulgent. No wonder I never acted on my big ideas. Coaching with Melissa Ambrosini was a HUGE turning point for me. She was able to explain the difference between my Mean Girl (that voice) and my higher self. My Mean Girl wasn't telling the truth - she was simply trying to keep me small and safe - and I didn't actually have to listen to her at all. WHAT A WAKE UP CALL. It changed everything. I left my job, started my own design business and Raspberry magazine. I stopped wearing heels. I started wearing stripes. Big things and small things: it suddenly felt like I was in control again. Hallelujah. Well that was a big intro, thanks for sticking with me, because I wanted to hammer home just HOW deep and far your Mean Girl can rule your life if you let her. 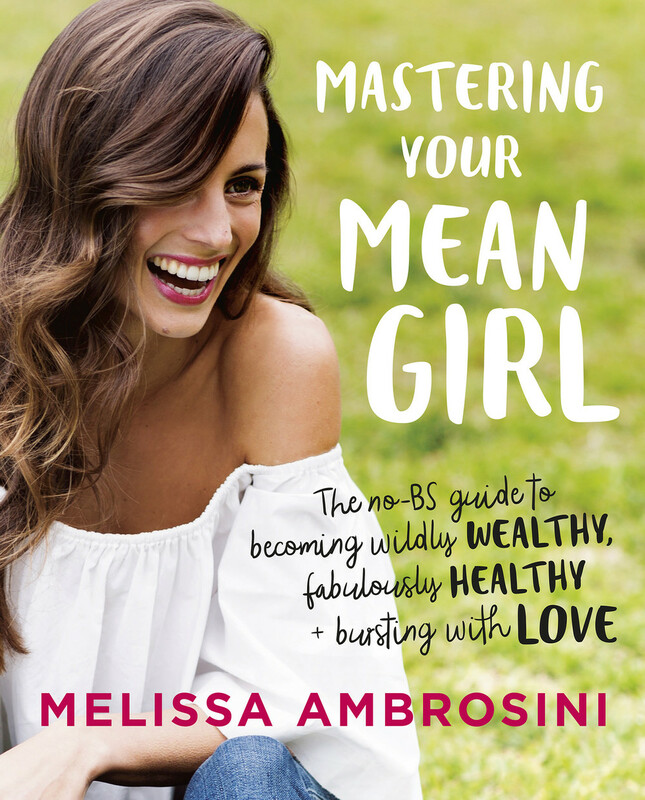 And now - Melissa Ambrosini, my former coach, has published this magnificent book - Mastering Your Mean Girl. Inside it's a mix of Melissa's (fascinating) personal story, all of the deep coaching material I worked on 1:1 with her, interactive Q+A sections to get into the nitty gritty of how your Mean Girl operates and tips to instigate and implement real changes. Some paragraphs can feel a little obvious, but that could be because I have been studying this concept for a few years now. Overall, it's beautiful, well written and fun to read. If you're feeling stuck or held back in your life, like you can't push past your 'flaws' to accomplish what your heart wants, you need to read this book. ALANA: For those women who might be at the beginning of their journey, and have only just realised they have a Mean Girl voice inside their head dictating to them, what is the one thing you'd suggest to begin Mastering their Mean Girl today? Practice awareness. Become aware of when your Mean Girl pops up and tells you that you’re not good enough, thin enough, whatever enough. Most times we are so unconscious and not present that we aren’t even aware of her internal dialogue, so bringing your awareness to her words is the first step. Gently close the door on her. Once you are aware that she has popped up, you can now choose to gently close the door on her. It’s not about fighting her, or waging an inner battle — that’ll just cause more pain and suffering. Instead, it’s a gentle, grateful act that comes from a place of love. Choose love instead. Once you have gently closed the door on her, choose to come back to your heart and choose love instead of fear. It’s so much more fulfilling when you do. ALANA: In your book, you talk a lot about worthiness. Could you share with us a time when you didn't believe in your true worth, but were able to turn it around by Mastering Your Mean Girl? MELISSA: There have been so many times, but one in particular that comes to mind was when I’d finished writing my book and received an offer from the world's largest publishing house (Penguin Random House) in New York. My Mean Girl had a field day: You’re not worthy of this amazing offer. No one’s actually going to read your book. They must have gotten you mixed up with some other REAL author…!! Not so nice, right?! But it was actually an awesome learning experience, and allowed me to put into practice (yet again!) everything I talk about in my book — especially dialling up my worthy-o-meter. I was able to let go of my fear-based limiting beliefs, gently close the door on my Mean Girl, and choose love instead. ALANA: For our readers who are bloggers and business women - what are the upsides to Mastering Your Mean Girl in a professional sense? How has it helped you in business? MELISSA: Mastering your Mean Girl has a massive impact on your business and career. When I first started out on this journey, my Mean Girl had a whole heap of go-to fears that she used to whisper non-stop in my ear: There’s no way this will ever work out. You’re never going to get enough clients. You can’t make money doing something you actually like — the world doesn’t work like that! (And let me just say, that was only the tip of the iceberg!) So working on my Mean Girl was actually an essential part of building up my business. I see so many women filled with fear when it comes to pursuing their passion and doing what they love — whether that means taking the leap to start your own biz, asking for a raise, or having the courage to publish that first blog post. If any of this sounds familiar, I can’t encourage you enough to take the time to really learn how to master those fears and deeply understand your Mean Girl. You won’t believe the difference it will make to your business and your life.